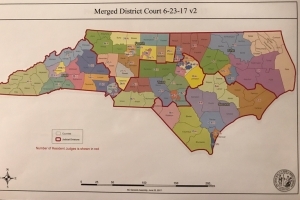 Rep. Justin Burr (R-Montgomery, Stanly) sent the legal community scrambling Sunday night when he tweeted out new prosecutorial and judicial district maps lawmakers will consider implementing this session. “Attached are the maps for the PCS to HB 717 which will be heard tomorrow at 4 pm in Judiciary 1. #ncleg #ncpol,” tweeted Burr, who did not return a request for comment Monday. The tweet included three maps that show new judicial divisions: prosecutorial districts, merged district courts and merged superior courts. The maps are dated June 23, and the bill they will be presented in is House Bill 717. Burr’s tweet appears to be the first that judges and attorneys knew of the proposed maps, though it’s not the first bill aimed at changing the judiciary he’s introduced this session without input from the governmental branch. 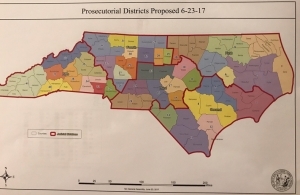 Peg Dorer, director of the North Carolina Conference of District Attorneys, was poring over the prosecutorial map Monday morning to determine how the changes would affect district attorneys. “I just think this is a mess,” she said in a phone interview. She said that changes to prosecutorial districts needed to be deliberative and careful. One of the early concerns she pointed to was combining Robeson and Scotland counties into one prosecutorial district. Currently, Robeson County is its own district — Dorer described it as the most violent county in North Carolina and said it has more pending murder cases than any other area. “Why put another district [with it]?” she asked. She also expressed resource concerns with the new prosecutorial map combining Anson, Union and Richmond counties. As far as the judicial districts, representatives are still trying to understand all the surprise changes. She described the changes to the judicial branch as monumental. The consequences, she added, will be a dilution of quality judicial districts. Morey questioned why the Administrative Office of the Courts wasn’t more communicative with the courts about the maps and said both lawyers and judges gathered for conferences over the last week in which representatives from the agency attended. AOC spokeswoman Sharon Gladwell did not respond to an email asking if the agency knew about the maps before Burr announced them. Jeremy Smith, a criminal defense attorney who practices state and federal law, said in looking at the maps for the first time that it was clear what lawmakers were trying to do. “That’s what gerrymandered districts look like,” he said. A former prosecutor, Smith said he has practiced on both sides and predicted the new maps, if passed, would cause a lot of upheaval. “It seems to me that this changes a lot of who people will be going in front of asking for justice without really any explanation for it,” Smith added. Advocates on Twitter condemned the maps, referring to them as judicial gerrymandering. 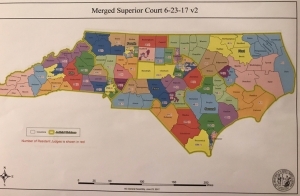 “Looks like some #ncga lawmakers plan to rig judicial maps for control of key cases. Tell them to stop their scheme: demnc.co/stopthescheme,” tweeted Democracy NC. Some Democratic lawmakers also referred to the maps as an attempt to gain partisan control of the courts. At a press conference Monday, Gov. Roy Cooper told reporters that the maps were an effort to “threaten” and “rig” the judiciary in their favor. “What I’ve heard, it’s not good,” he said. The maps will be discussed publicly at 4 p.m. today at the Judiciary I House Committee meeting in room 415 of the Legislative Office Building. You can listen to the meeting online here. You can see the state’s current maps here.